Babybird are an English indie band that formed in 1995, fronted by Stephen Jones, who has also released records as a solo artist, using his own name, and as Black Reindeer. Jones started writing and recording songs at home and his first collection of these demos, I Was Born a Man, was released in July 1995 using the name Babybird. He formed a band in order to tour and promote this work. In 1996, Babybird signed to Echo Records and their first single was released in July 1996. Babybird were dropped from their record label in 2000 after their third album, Bugged, had poor sales. The band then split. Jones continued on his own, writing fiction, releasing solo work and created the score for the film Blessed. In October 2005, the band reformed with three members and created another album released in September 2006. They went on tour in November 2009 and then split again in 2013. After a number of Babybird releases on Bandcamp from 2015, Jones reunited the band once again in late 2017 with a new line up. New compilation album Happy Stupid Nothing was released in 2019 . Jones had begun writing songs and recording home demos as part of an experimental theatre group in Nottingham. A collection of these demos, I Was Born a Man, was released in July 1995, under the name Babybird. He recruited a band made up of Huw Chadbourn (keyboards), Robert Gregory (drums), John Pedder (bass) and Luke Scott (guitar), in order to tour and promote his work. During 1995, two further albums of demo recordings were released under the name Babybird (Bad Shave and Fatherhood) and two in 1996 (The Happiest Man Alive and Dying Happy). Babybird were signed to Echo Records (a division of the Chrysalis Group), and the first authentic single, a full-band recording of "Goodnight", which had appeared in demo form on Fatherhood, was released in July 1996, becoming a minor hit in the UK Singles Chart. The group's second single, "You're Gorgeous", reached number 3 in the UK in October 1996, and was one of the biggest selling singles of the year, going on to chart around the world. However, it presented a more commercial face to the public in comparison to Jones's earlier work, as well as in comparison to the rest of the material on the Ugly Beautiful album. The album produced two more hit singles in "Candy Girl" and "Cornershop". In 1997 the band returned to the studio, with producer Darren Allison,who had previously worked with Spiritualized and The Divine Comedy. They recorded two new tracks - a brand new version of Bad Shave, and a re-working of CFC. These new tracks were included on the 1997 U.S.A. release of Ugly Beautiful. Babybird returned, minus keyboardist Huw Chadbourn, in 1998 with There's Something Going On, preceded by a single, "Bad Old Man". The album was a modest success and was followed by further minor hits, "If You'll Be Mine" and "Back Together". In 2000, a line-up of Babybird comprising Jones, Scott and Matt Hay created a third album. Bugged. Sales were poor and the two singles from it, "The F-Word" (later the theme tune to Gordon Ramsay's UK TV cookery show of the same name) and "Out of Sight" barely dented the charts. Babybird were dropped by their record label soon after. A third single from the album, "Fireflies" / "Getaway" was released on Animal Noise records, but sold few copies. The band subsequently split. Jones went on to write fiction, release solo work and score a film, Blessed, in 2004. In October 2005, a posting on the Babybird website announced that the band had reformed as a three-piece featuring Jones, Scott and Robert Gregory. An album, Between My Ears There Is Nothing But Music was released on 25 September 2006. In August 2009, it was announced that the band would be doing a tour of four gigs in November 2009 to promote the album Ex-Maniac, which was released in February 2010. The line-up consisted of Jones, Scott and Gregory, with a cameo appearance from long-term fan Johnny Depp on the track "Unloveable". Depp also directed the video. In September 2009, Babybird launched their official online community, with clips from the forthcoming album, a new video created by Jones with Jones participating in discussions on the website. In February 2012, it was announced that Babybird would be playing the LeeStock Music Festival alongside Wheatus in Sudbury, Suffolk. In 2013, Stephen Jones announced via his Twitter feed that Babybird was no more. He has since released a number of solo albums under the names "Black Reindeer", "Deluder", "Arthritis Kid", "The Great Sadness" and "Trucker". ^ McKeating, Scott (14 February 2013). "Babybird". The Quietus. Retrieved 6 April 2014. ^ Brown, Jason (4 March 2019). "Happy Stupid Nothing". [Discogs]. Retrieved 4 March 2019. ^ a b c Strong, Martin C. (2000). The Great Rock Discography (5th ed.). Edinburgh: Mojo Books. p. 42. ISBN 1-84195-017-3. ^ Roberts, David (2006). British Hit Singles & Albums (19th ed.). London: Guinness World Records Limited. p. 37. ISBN 1-904994-10-5. ^ "Johnny Depp makes 'cameo appearance' on new Babybird album | News". Nme.Com. 30 September 2009. Retrieved 24 April 2014. ^ "Unloveable by Babybird Songfacts". Songfacts.com. Retrieved 24 April 2014. ^ "first names announced for LeeStock charity event". eFestivals.co.uk. Retrieved 24 April 2014. ^ "Babybird - New Songs, Playlists & Latest News - BBC Music". BBC. Retrieved 25 February 2019. ^ "Dodgy | HOMEGROWN 25". homegrown25.dodgyology.com. Retrieved 25 February 2019. ^ "UK Chartlog – 1994–2010 Darren B – David Byrne". zobbel.de. Retrieved 16 July 2014. ^ a b "Babybird / Artist / Official Charts". The Official UK Charts Company. Retrieved 25 May 2016. ^ a b "charts.org.nz — Discography Babybird". © 2006-2014 Hung Medien / hitparade.ch. Retrieved 16 July 2014. 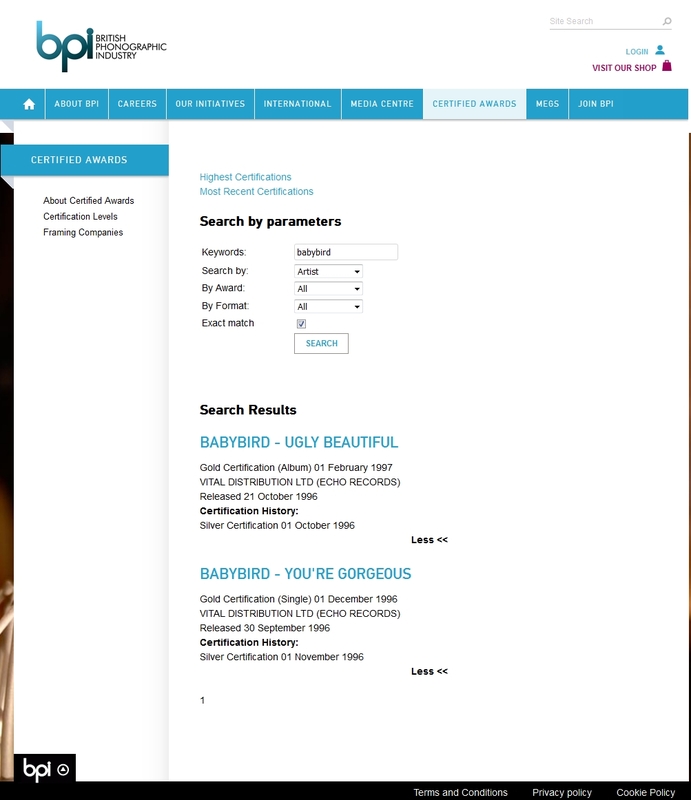 ^ a b "BPI > Certified Awards > Search results for: Babybird (from bpi.co.uk)". Imgur.com (original site published by British Phonographic Industry). Retrieved 25 May 2016. Top 50 peaks: "australian-charts.com > Babybird in Australian Charts". Hung Medien. Archived from the original on 24 April 2016. Retrieved 2016-05-25. "Goodnight", "Candy Girl", "Cornershop", "Bad Old Man" and "If You'll Be Mine": "Response from ARIA re: chart inquiry, received 24 May 2016". Imgur.com. Retrieved 25 May 2016. ^ "lescharts.com > Babybird dans les Charts Français" (in French). Hung Medien. Archived from the original on 30 June 2016. Retrieved 2016-05-25. ^ "Offizielle Deutsche Charts > Babybird – You're Gorgeous (single)" (in German). GfK Entertainment. Retrieved 25 May 2016. 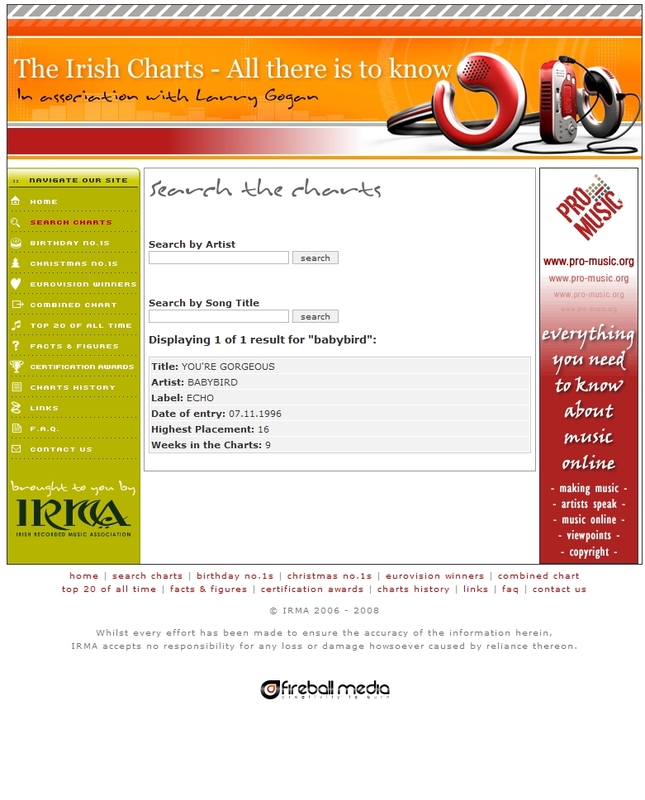 ^ "The Irish Charts – All there is to know > Search results for: Babybird (from irishcharts.ie)". Imgur.com (original site published by Fireball Media). Retrieved 25 May 2016. ^ "swedishcharts.com > Babybird in Swedish Charts". Hung Medien. Archived from the original on 13 August 2016. Retrieved 2016-05-25. This page was last edited on 19 April 2019, at 05:58 (UTC).